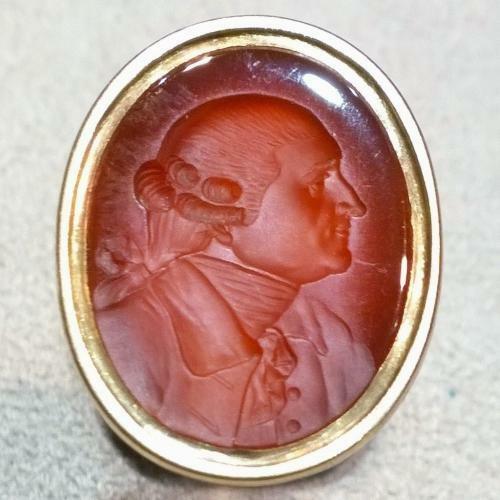 A gold fob seal with very fine carved carnelian intaglio portrait of a the famous 18th century actor David Garrick. Intaglio portraits of this quality are very rare and were carried out by a small number of engravers, Edward Burch and his pupil Nathaniel Marchant being the most famous. The collecting of carved classical gems was very popular in aristocratic circles at the time, a collector would often acquire carved intaglios and a gems on the grand tour, and collectors would compete for the finest engraved stones. James Tassie was a collector of carved gems and wax impressions of famous classical stones, he produced a huge series of glass reproductions of these stones and commissioned portraits of famous contemporaries such as Adam Smith. These portraits were often carried out by Birch or Marchant, it would not be unreasonable to assume that this portrait was carried out by a carver of equal skill. Tassie has the impression of this intaglio in his catalogue along with four other similar portraits of Garrick by Marchant, and William Brown.